We were sitting in the shadow of history, peddling our wares like those who came before. Authors, food vendors, artists, musicians, crafters, historians, historic car fans and others at the roadside park that celebrates one of the creations that drove the regional economy and forged the social and economic landscape of North Jersey, the Morris Canal. This was first-ever Park Fest on June 10, the event sponsored by Warren County Park Foundation and the Morris Canal Committee at Bread Lock Park, which features a replica canal boat, the dug path of the actual canal and the machinery that made the lock work. Simple stuff drenched in history and economic importance. Congratulations to the organizers, for this event drew good sized crowds who mingled curiously among the displays. And thanks to the many readers who both purchases copies of the Frank Nagler mysteries, or listened to my rambling explanation about the books, and still walked away with information cards and flyers. Looking forward to next year’s Park Fest. Now it’s off to BooksNJ2017, at the Paramus Public Library grounds beginning at 1 p.m. The panel will be hosted by Don Smith, and includes writers Kristen Houghton, Dave White, and Susan Clark. It is scheduled for 3:40 p.m. at tent 221B Baker Street. BooksNJ2017 will feature over 110 authors. 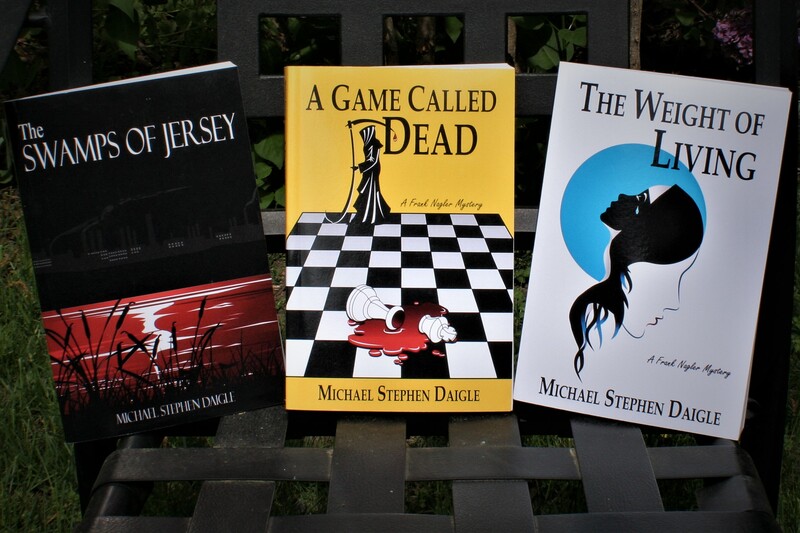 This entry was posted in Bergen County Cooperative Library System, BooksNJ2017, Fiction, Greater Lehigh Valley Writer's Group, Hot in Hunterdon; Georjean Trinkle, Imzadi Publishing LLC, Michael Stephen Daigle, Mystery Writers of America, Paramus Public Library, Sally Ember, www.michaelstephendaigle.com and tagged " "The Summer of the Homerun", "A Game Called Dead", "The Resurrection of Leo, "The Swamps of Jersey" Imzadi Publishing, "The Weight of Living", Fiction, Frank Nagler, Ironton, New Jersey. Bookmark the permalink.